StopTech recognizes that great brakes need to look as good as they perform. Performance wheels and tires are best complemented with StopTech SportStop Cross-Drilled & Slotted rotors. 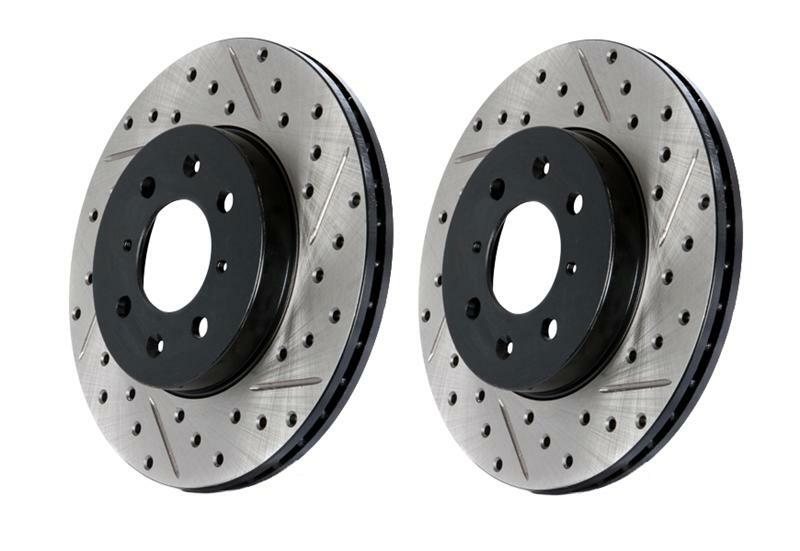 SportStop Drilled & Slotted brake rotors prevent glazing of the pads, add bite and improve wet and dry braking performance. Every SportStop Drilled & Slotted brake rotor is produced from a high quality Centric Parts blank casting and finished in a durable e-coating for corrosion resistance. SportStop Drilled & Slotted rotors look great behind custom wheels, improve the initial bite of the brake pads, and help wipe away the debris that forms between the pad and the disc. A set of SportStop cross-Drilled & Slotted rear replacement rotors is a great way to match the aesthetics of a StopTech Big Brake Kit with the cross-Drilled & Slotted rotor option. Nearly all SportStop Cross-Drilled & Slotted rotors have unique Drilled & Slotted hole patterns for the left and right sides of the vehicle. For these directional patterns, straight vane or pillar vane rotors are used to ensure that a Drilled & Slotted hole never touches a cooling vane.